The luscious lady up above is Cleo Moore, one of the bad girls that populated film noir. 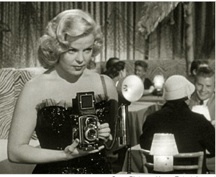 She’s the focus, and what a focus, of three films in a two volume set of Bad Girls of Film Noir. The Killer That Stalked New Yor k—Evelyn Keyes, Suellen in Gone With the Wind, plays a smuggler who brings in not only diamonds, but also smallpox. She is tracked by the Treasury agent, and by the medical authorities in an attempt to catch her before she can infect the city. In part it plays almost as a hygiene/health class film that stresses the importance of vaccination. In light of the anthrax attack, and the possibility of bio-terrorism, a possibility that is discussed in this article, the movie has interesting implications. Two of a Kind —Lizabeth Scott (Dead Reckoning) and Edmund O’Brien (DOA) star as part of a conspiracy to convince a rich couple that O’Brien is their missing heir. This requires Scott to slam a car door on O’Brien’s finger hard enough that he will lose the tip. She does this with a good bit of relish. Is Lizabeth Scott worth losing part of a finger for? Bad For Each Other —Charlton Heston and Scott costar in a medical drama set in a Pennsylvania coal town, named, oddly enough, Coalville. (I should note that while Coalville is fictional, there is a town called Petrolia in that neck of the woods.) My major complaint here is that the film dwells on society doctors, those who care for the rich. It portrays them as catering to a bunch of rich, idle, neurotic hypochondriacs. Now while rich people don’t get diseases that are associated with slums, they are just as likely to get cancer, heart disease, diabetes, etc., as poor people. Scott tempts Heston to a career as a society doctor, but a mine disaster brings him to his senses. The Glass Wall —My wife and I are fans of The Naked City. I really hate saying that title because it sounds like a nudist camp. (In fact I think there is one called Naked City. Never been, and probably never will.) Naked City was nominally a cop show, in reality it was an anthology drama that used NYC as a major character in the plays that unfolded. The Glass Wall has some of that feel. It’s the story of an Hungarian displaced person (Vittorio Gassman) who has stowed away on a boat to come to the US. He gets involved with Gloria Grahame (Violet in It’s A Wonderful Life). The glass wall of the title is the UN building. While the story deals with an illegal immigrant, there are several important differences from the current discussion on immigration. Gassman’s character accepts American values, and wants to partake in the American system. He does not regard that US as simply a source of money to send back to his family. The immigration authorities actually care about enforcing the immigration laws. The UN Commission on Human Rights was actually a respectable institution, not the voice for every anti-Semitic bum on the planet. Night Editor —Janis Carter is the bad girl in this one. In fact she’s the baddest of the lot so far. The story centers around a married cop who is having an affair with a society dame (Carter). They witness a murder, and for him to do anything means the end of his career, and the breakup of his family. One Girl’s Confession —A girl feels that her father has been cheated. She robs the perp, and confesses, but does not reveal where she hid the money. There is an ironic twist at the end, and Cleo Moore is lovely. Women’s Prison —I can’t say this has an all-star cast, but it does have Ida Lupino, Jan Sterling, and Howard Duff in addition to Miss Moore. A woman is sent to prison and suffers at the hands of a sadistic warden (Lupino). An interesting version of the prison genre. Over-Exposed —Cleo Moore again. This time she plays a girl who after being arrested for allegedly hustling drinks becomes a photographer. She hooks up with reporter Richard Crenna, romance ensues, as well as romantic complications. She accidentally snaps a picture of a gangster that implicates him in a murder. The picture of Cleo with her Rolleiflex TLR (Twin Lens Reflex) accompanied an article in the NY Times. For some reason that picture stuck with me. The girls aren’t really all that bad, and the films aren’t, for the most part noir, certainly not in the same way as Out of the Past , or Gun Crazy , but they’re decent stories, and a pretty enjoyable way to spend a little under 90 minutes.